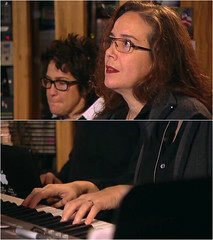 The Macintosh is an important tool for musicians Wendy Melvoin and Lisa Coleman of Prince fame. In the last years the artistic duo has been hard at work scoring music for movies and TV shows and Apple products play a substantial role. played entirely by Melvoin and Coleman themselves and is produced on three Intel Macs and a hard drive RAID system. In the picture -taken from a Heroes “behind the scenes” programme- you can see that while Lisa plays looking at the footage Wendy is using a black MacBook.